Explore the Drop™ chair in a modern, monochrome look. The Drop is a small chair with a big personality and it is as fresh and vibrant as a new design but with a rare heritage. The design of the back combines a warm embrace with freedom of movement, resulting in a surprising level of comfort. 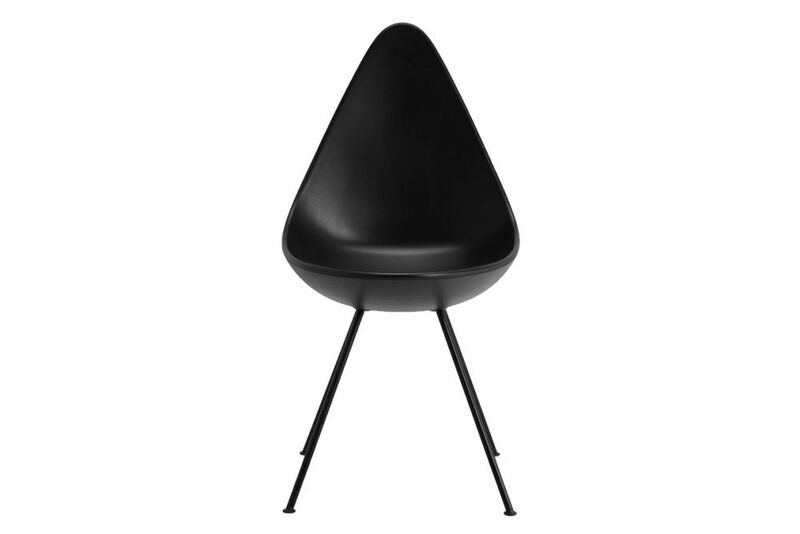 Arne Jacobsen was born on February 11, 1902 in Copenhagen. His father, Johan Jacobsen, was a wholesale trader in safety pins and snap fasteners. His mother, Pouline Jacobsen, was trained as a bank clerk and often painted floral motifs in her spare time. The family lived in Claessensgade, Copenhagen in a typical Victorian style home. Maybe that is why Arne, as a child, painted the coloured wallpaper in his room white, as a contrast to his parents’ overly decorated taste. At Nærum Boarding School, he met the Lassen brothers; later, Flemming Lassen was to become his partner in a series of architectural projects. Arne Jacobsen was described as a restless pupil, always up to pranks, and often with a self-deprecating humour. Already as a child, he showed an extraordinary talent for drawing and depicting nature through scrupulous studies. Originally, Jacobsen wanted to be painter, but his father felt that architect was a more sensible choice, and that is how it was. Nevertheless, Jacobsen later had ample opportunity to paint and to express his ideas through highly accurate drawings. Jacobsen’s travelling began already in his twenties, when he went to sea. The voyage, the only one in his career as a sailor, went to New York. Then followed an apprenticeship as a bricklayer in Germany and a series of study and drawing excursions to Italy. During this period, Jacobsen produced some of his finest watercolours with classic motifs, where he captures atmospheres and renders materials and shapes accurately and carefully. From the beginning of his career, Jacobsen turned his gaze abroad, without ever abandoning Denmark or the Danish traditions in his field. In summarising Jacobsen as a person, one arrives at a picture that reflects to a high degree the nuances in his purely professional production: On the one hand the insistent, perfectionist modernist, to whom no detail was trivial, although the main picture was basically black/white and unambiguous. On the other hand, the nature-loving botanist and jovial family man. Overall, the professionalism and almost nerdy passion for his work are indispensable aspects in descriptions of Jacobsen - including his own descriptions. Republic of Fritz Hansen is an exclusive, international design brand whose timeless collection unites world-famous classic and contemporary furniture, lightning and accessories.